Apple has retained its top spot as the world's most valuable company in the latest rankings from consulting firm Interbrand, reports The New York Times. With its top spot in the rankings, Apple also bested fellow technology companies Google, IBM, Microsoft, and Samsung, which came in 2nd, 4th, 5th, and 7th place, respectively. On September 9, 2014, Tim Cook held up a wallet and said, "Our ambition is to replace this." A bold statement to be sure—but we'd expect nothing less from Apple, #1 on the Best Global Brands list for the second year in a row. Referring to Apple Pay, a new mobile payments platform that enables consumers to pay for items with Apple devices, Cook signaled that Steve Jobs's 2001 vision of Apple becoming the "digital hub" of its consumers' lives (Macworld Expo 2001) has finally been fulfilled. In what CNNMoney.com called "one of the most ambitious product launches in its history," Apple unveiled not only Apple Pay, but also the long-anticipated Apple Watch, a wearable device that combines health and fitness monitoring with mobile computer capabilities, and launched two new iPhones that are faster and smarter than previous versions and feature larger screens. The iPhone 6 Plus, which embraces the larger-form factors, could pose a serious challenge to Samsung's GALAXY Note. Though iPhone sales were up prior to the new product launch, particularly in China where China Mobile is now signed as a carrier, the iPhone 6 Plus may further assist penetration in Asian markets where larger-screened devices are preferred. In last year's survey, Apple overtook Coca-Cola as the most valuable brand in the world after the beverage corporation spent 13 years in the top spot. Apple was valued at $118.9 billion in this year's survey, up $20.6 billion from its $98.3 billion valuation in 2013. Apple launched the larger 4.7-inch and 5.5-inch iPhone 6 last month, with both devices selling a record-breaking ten million units during their first three days on sale. The company also announced its highly-anticipated Apple Watch wearable device in September, which will come in multiple screen sizes and collections when it launches next year. Apple is expected to unveil new iPads, a 27-inch iMac with Retina Display and perhaps a new Mac Mini at an event next Thursday, October 16. 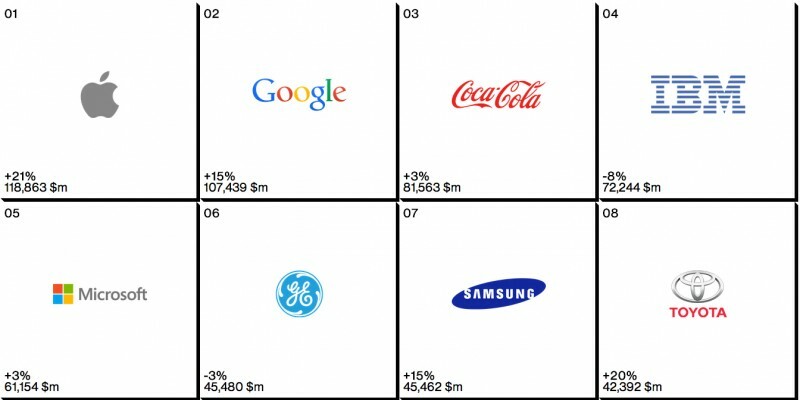 Yet somehow that unknown brand is above Samsung?! That unknown brand probably designs their own stuff, so yeah - in that respect, they should be above Korean copycats Samsung. Are you guys actually being serious or do you not know that "unknown brand" is General Electric? They make a majority of the light bulbs, appliances, etc. in people's homes, plus things like plane engines and wind turbines. Big money. I never really realized how understated and elegant Apple's logo was until looking at this grid. LMAO to the people who don't know who general electric is. The failing of American education and common sense on full display. That's why. This is a world brand survey, not a US one, and most people here have probably never even heard of General Electric. Most people IN Business world wide HAVE heard of GE. Seriously!! It is rated the fifth largest company in the world by Forbes and they are one of the oldest large company in existence. They've had 100+ year of marketing behind their name :-). They didn't call it a consumer brand survey, did it. It is the value of the brand. GE Capital Finance (provides commercial lending and leasing, as well as a range of financial services for health care, media, communications, entertainment, consumers, real estate, and aviation) Present in 55 countries. 44B in revenue, 8B in profit. - GE Power & Water. So, it seems GE will soon be mostly out of the consumer sector, except for a small part of their lighting revenues. I dunno... all of the "Why is IBM on this list?" and "Who is GE?" comments aren't really all that funny and are bordering on just plain sad. It's like people who own iPhone's are absolutely clueless about other technology around them, and even the technology that goes into the devices that they own. All they know is "Apple", and who's directly competing with them. IBM and GE are two of the biggest companies in the world, but because they don't make smartphones, some people are like "Huh?" And then there's the people who don't realize Samsung is a global company who makes much more than just smartphones. All some people care about is that Apple is #1 and Samsung is #7. And that somehow fills them with a happy, warm, and validated feeling. Argh IBM's logo really needs a refresh. It's based on the technical limitations of hardware, photocopiers to be exact - not exactly something a hardware company should have in their logo IMO. That aside, it's damn ugly too! It is Iconic and since its not used much in retail, doesn't need to be very cute ;-). America is doing just fine. The top 6 companies in that list are all American. IBM above microsoft?!? I can only imagine IBM have any brand value in the corporate section, consumers dont care about that name anymore, I would think. You don't know what GE (General Electric) is? Seriously?